Q. Do I need to book a place, or can I turn up at the venue on the night? A. Booking NOT necessary as LONG AS a minimum of 6 people are needed to cover costs to run the night. Q. What is the maximum number of people that can be accommodated at the venue. Q. How much does it cost to attend the class in Venue 4? A. Price is €13 person - for canvass. You come away with your own Canvas at the end of the night or €9 for Acrylics paper or bring your own canvas (no larger than 16 x 12) and will have had a new adventure in the process. Q. How much does it cost to have Acrylics Craic run a session at my own venue? A. Price is €10 per person again with a minimum booking of 6 persons. Q. What do I need to bring with me to the night? A. Just your favorite tipple and your good self - everything else is supplied. Q. If our group decides to continue our night of Craic, is there anywhere we can leave our paintings at for the rest of the night? Q. I have never taken up a brush to paint in my life before. Will I be able to keep up with the progress of the class on the night? 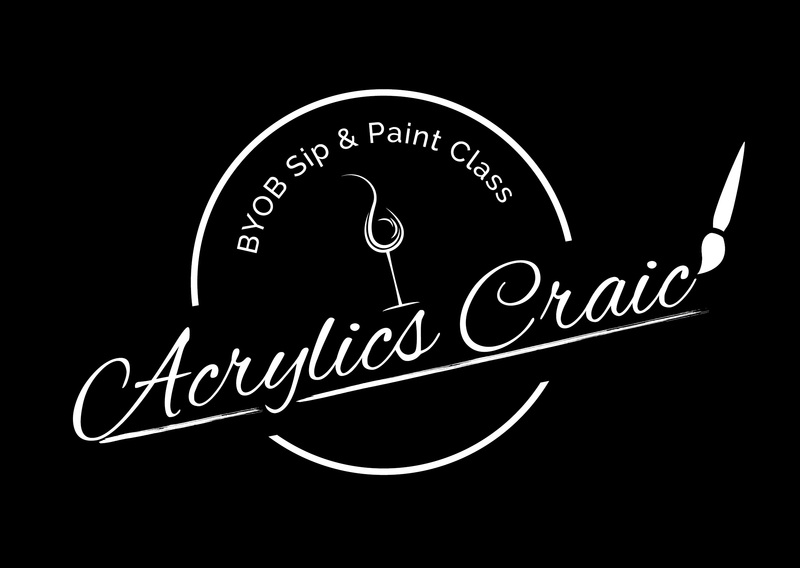 A. Acrylics Craic is about adults having fun! No experience necessary, our paintings are guided and easy to do, but if you like, you can actually paint away at what ever pleases you. No rules about following the leader here. Just relax and have fun! Q. can I book a private party for my friends and i to celebrate a special occasion? A. Yes of course..... and we will make your night special...fun.. or poignant. which ever you prefer.